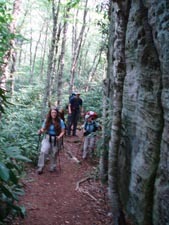 Description: This is the fourth and final circuit hike to be described for this venue. I won’t reiterate the description of hiking along Otter Creek and its water works here except to say that, when the water levels are right, it’s nothing short of mystical. This particular “Lollipop” loop can be done as a long 13.8 mile day hike or a nice overnight backpacking trip (9.0/4.7 miles, respectively). Better yet, do the overnighter but insert a third day in the middle, establish a base camp and do the optional day hike also described here. 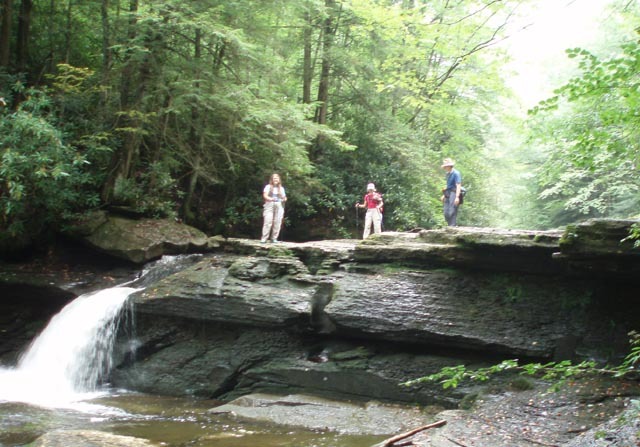 If you don’t want to or don’t have the time to do the day hike at least do an out-and-back along Otter Creek Tr from camp to Moore’s Run. You’ll be glad you did. Note: Google Directions may call FR303 Public Rd 63. Trail Notes: There are no blazes or trail signs within the Wilderness proper. Trails and trail junctions are usually obvious, except where noted. Trail junctions are marked with cairns. If you have a good map and compass it’s hard to get lost. From the parking area proceed north on the gravel road. You will pass Condon Run Tr on the left before the kiosk (no sign but obvious), pass through a forest gate and pass signed Hendrick Camp Tr on the right. Shortly after crossing Condon Run (Either splash across or use the newly constructed footbridge to the left.) bear left onto a footpath and climb a short distance to a railroad grade. Enjoy pretty flat walking for the next 1.28 miles. Cross Yellow Creek and soon turn left onto Yellow Creek Trail, another railroad marked by cairns. The grade remains slight. In another 0.78 miles arrive at a fork in the trail. Yellow Creek Tr goes to the left. You want to bear right onto McGowan Mt Tr. The trail alternates between footpaths and railroad grades. The only real steep parts are when the footpaths are used to jump from one RR grade to the next. This will happen twice before reaching the crest of the mountain. ( Early on you will pass what appears to be a maintained trail on the right. 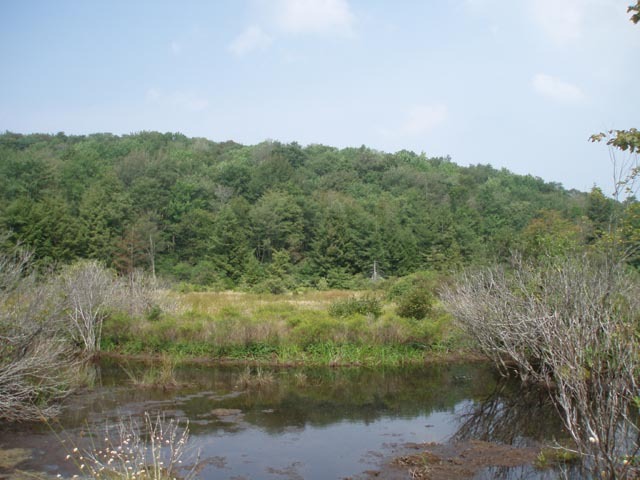 This leads to an overlook of the Yellow Creek Bogs. Supposedly some pretty intense bushwhacking is required over the last few yards. We didn’t attempt it.) You’ll know you’re at the top when you pass between about 3-4 really large boulders that seemed to have been left behind by some power greater than us. Once there you will once again enjoy some pretty flat walking for about 1.5 miles. At 4.13 miles from the Yellow Creek/McGowan Mt Tr junction arrive at another trail junction. This is Moore Run Tr. Turn right. The tread will remain flat. It will also become muddy for a short distance as you pass through the upper Moore Run Bogs. 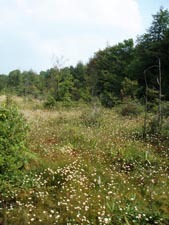 In 0.7 miles there is an old hidden trail that leads to the lower bogs. Attempts have been made to conceal its junction. If you have a GPS and the Waypoint for it described in the NG TOPO! Or GPS text files provided here it is pretty easy to find. To visit the bog you will have to do some bushwhacking through a Rhododendron thicket to the right and downhill from the old trail junction. Continue along your original route. In another 0.53 miles pass a campsite and then Turkey Ridge Tr, both on the left. 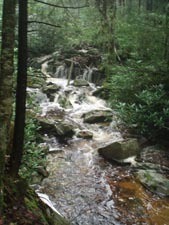 Shortly after this you will descend steeply to a short distance to cross Moore Run. Over the next few yards parts of the trail might seem to be in the stream before you cross another fork of the run and step up onto another railroad grade. In 2.56 miles from the Turkey Ridge Tr junction arrive at a nice split-level campsite on the right and then Otter Creek itself shortly after. If backpacking, this is the perfect spot to end the day having hiked about 9 miles. There is a very deep swimming hole just down stream. If the campsite is taken, ford Otter Creek. 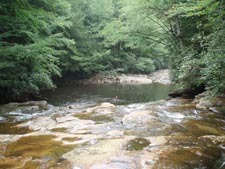 There is a huge campsite at possession Cam just below the swimming hole and several smaller ones upstream. 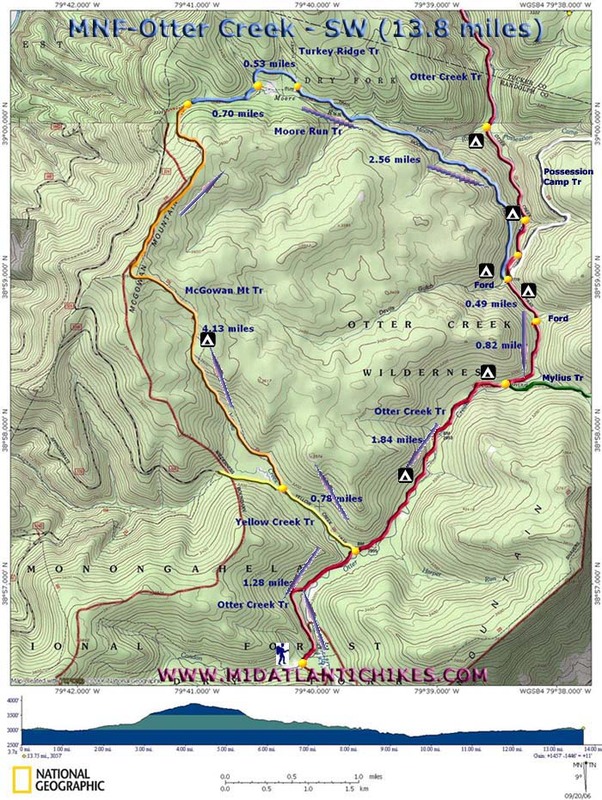 If you want to do the optional day hike see the trail notes at the end of this discussion. To continue the main loop ford Otter Creek, if you have not done so already in search of a campsite. Directly in front of you will be a large rock with Possession Camp Tr behind it. Otter Creek Tr will be to your left and right. Turn right onto Otter Creek Tr. In 0.49 miles ford a side stream and then the main creek again. This is the last major ford of Otter Creek. The rest of the trip is mostly on old railroad grades. Short footpaths connect them. There are some places where the main RR grades are quite wet or boggy. If you encounter this back up a short distance and look for other footpaths that reroute the trail to slightly higher and/or dryer grades. If you miss these bypasses you will still end up in the right place. You just might be a little muddier than you wanted to be. In 1.84 miles from the last ford of Otter Creek pass Yellow Creek Tr that you used on your first day on the right and re-cross Yellow Creek. From there retrace the initial 1.28 miles of your trip. 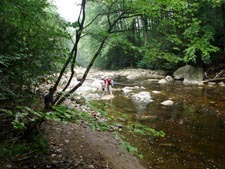 Trail Notes for Optional Day Hike: From the Moore Run Tr campsite on the west bank of Otter Creek, ford the creek. Directly in front of you will be a large rock with Possession Camp Tr behind it. Otter Creek Tr will be to your left and right. Walk behind the rock and pick up Possession Camp Tr. In a few steps this becomes an easy to follow railroad grade. Follow it in and out of coves and clusters of Hemlock. As you cross Possession Camp Run, check out the outdoors industrial artifacts museum. 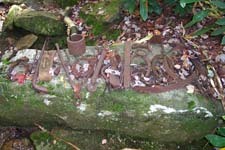 The collection of metal objects found by hikers is constantly growing. At 3.16 miles reach the junction with Green Mt Tr and a campsite. Turn left and soon pass another large campsite on the right. In 0.46 miles leave the railroad grade on a footpath to the left. In another 0.65 miles pass another campsite on the left. Shortly after this the trail will become very steep, rocky and eroded. Take your time here. In another 0.68 miles reach the junction with Otter Creek Tr. Turn left here. Pass a large campsite on the left and soon arrive at another campsite and crossing point. Ford the creek. Here the waterworks show begins as you pass one little chute or waterfall after another. Several campsites are marked along the route for future reference and to aid you in navigation. Shortly after the second campsite after the ford the trail becomes littered with some serious blowdowns. Some are big single trees while others are pretty large tangles. When last there (August, 2006) we met a Ranger who was conducting a survey of the damage so that maintenance crews can be organized to clear the trail. Hopefully they will get it done. 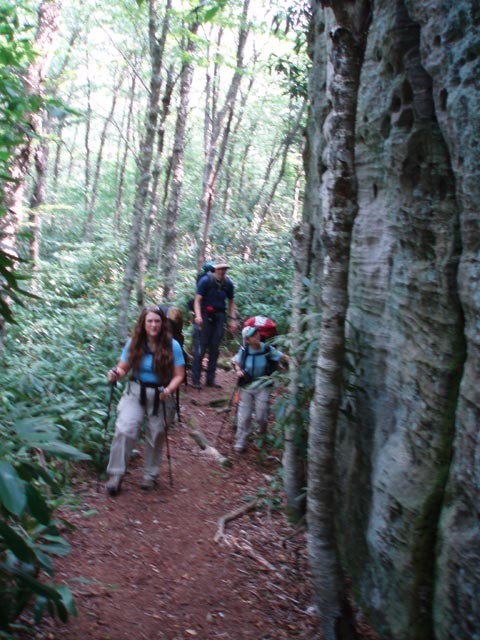 (If anyone hikes this segment let us know the condition of the trail.) 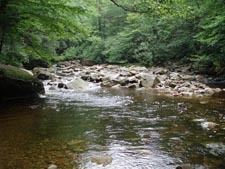 At about 1.8 miles from the ford reach the confluence with Moore Run. You’ll have to cross the run but first take time to visit the waterworks. This has to be the best break spot in the Wilderness! Cross Moore Run and pass another campsite on the right. At 0.89 miles from the run pass another campsite on the left. In another 0.58 miles arrive at a nice waterfall with an interesting hole that is bored right through about 10 feet of rock. Almost directly across the trail from the falls, up on a short hill, is yet another campsite. In another 0.24 miles come to the next ford of Otter Creek. 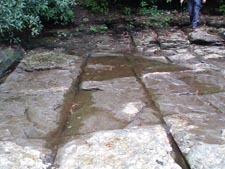 Many people use a pretty tricky rock hop on the upstream side of the ford. This can be difficult especially when the water is high. I prefer to cross downstream where the creek bed is one flat piece of rock. If the water is low enough you might not have to take your boots off. After the ford arrive at the spacious Possession Camp campsite. You can fit an army in here! There used to be a shelter but it was removed in keeping with wilderness guidelines. After you pass through Possession Camp keep an eye out for that one big rock in front of Possession Camp Tr and the cairns for Moore Run Tr. Ford the creek and return to your campsite. on possession Camp trail, where it crosses the creek. around in the creek and found stuff, and laid it on the rock. and left it for the historians to figure out. I enjoy your web site. Will have comments to add to it later. Outing Critique: I used to visit the Otter Creek Wilderness frequently in the 90's. I always enjoyed the area, even if it was sometimes over used and crowded. I wanted to introduce some fellow backpackers to this wonderful wilderness, which I hadn't visited in 15 years. 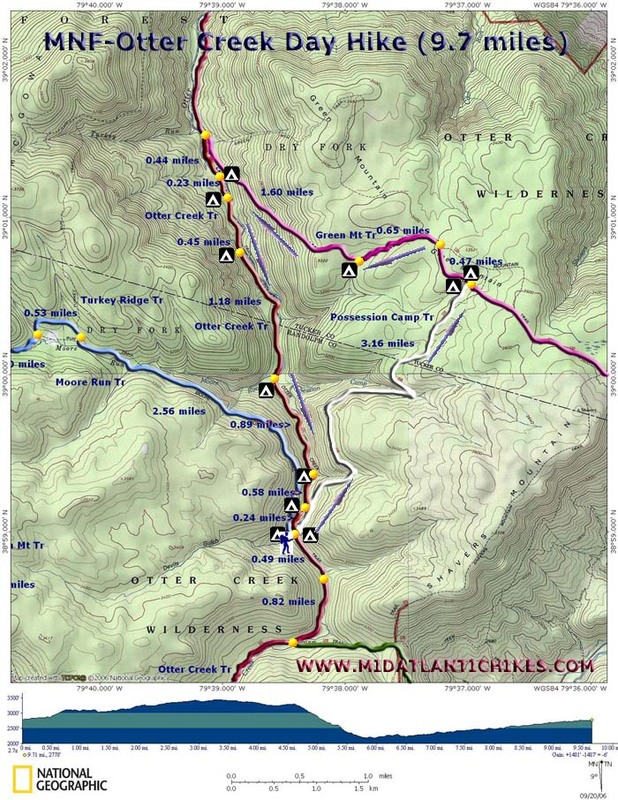 Six of us planned to hike this route, as described, and then set up a base camp at Possession Camp and do the day hike on Saturday. I was very surprised at the condition of some of the trails. 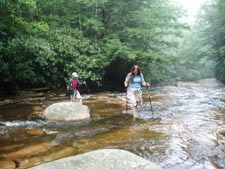 We encountered a few other hikers who told us that Yellow Creek Trail was impassable. The Rhododendrons and Mountain Laurel are very thick and have almost fenced off the trail in some spots. There are also a few blow downs blocking parts of the route. We did manage to push, duck, and climb our way through to McGowan Mt Trail, which was more of the same. The trail down Moore Run becomes very muddy going through the bog and then is overgrown and littered with blow downs after it enters the woods. All of the old campsites on the Moore Run side of Otter Creek are buried under blow downs and completely inaccessible. Possession Camp is mostly overgrown with tall plants but still a nice campsite, with a pretty good swimming hole. The first night it rained and by morning the Otter Creek had risen a couple feet and was moving like a freight train - quite an awesome sight! We attempted the day hike up Possession Camp Trail, but either the trail is gone, about 1/2 mile up where it reaches an unnamed creek/runoff, or it has been re-routed and crosses the runoff earlier than the maps show. That runoff was swollen by rain and had become a good size waterfall that we could not cross, so we could not even attempt to complete the day hike in that direction. 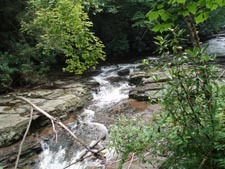 We went back to the Otter Creek Trail, but it crosses the creek just north of Possession Camp and none of us were willing to risk taking that train ride. On Sunday we hiked out following the Otter Creek Trail and only had to cross it once. The trail was in very poor eroded condition in some places because it has been allowed to become a stream whenever it rains. I was told that the trail system in the Otter Creek Wilderness has not been maintained by the forest service since 2008. 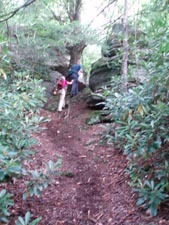 Volunteers are needed to clear, repair, and maintain these trails or they will be gone, soon. Outing Critique: Hiked from south entrance of Otter Creek Wilderness to the campsite just before the second crossing of the Creek. I'm 67 years old with COPD and a bad back and I often hike by myself. Therefore, I hike in 4-5 miles and set up a base camp for 2-3 days. This trip I stayed 3 days. Can't carry any more food. 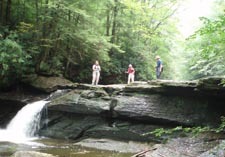 One day, I hiked up the Moore Run Trail to the junction with the Turkey Run Trail. I didn't go further because the rhododendron was very thick and the scenery was very unimpressive. 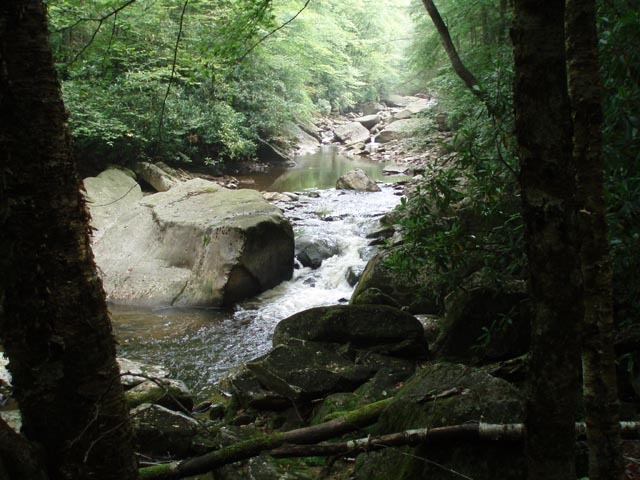 The second day I hiked up to where the Otter Creek Trail crosses Moore Run. I didn't go further because Moore Run was deep enough to require me to change to water shoes which I didn't feel like doing again. The best views of Otter Creek are north of the second crossing. Otter Creek Trail in from the south entrance was unimpressive. It was primarily one big jungle of rhododendron. There are few views of Otter Creek between the south entrance and the first crossing of Otter Creek. There are 4 campsites with water access between the first and second crossings of Otter Creek. Two are on either side of the Creek at the first crossing and have easy access to water. The third is several hundred yards north of the first crossing and access to water may be difficult. The fourth is just south of the second crossing and has easy access to water. This is the campsite I was at for the 3 nights. I hiked in on a Sunday and saw 12-15 people hiking out. I did not see another hiker for the 3 days I was in. 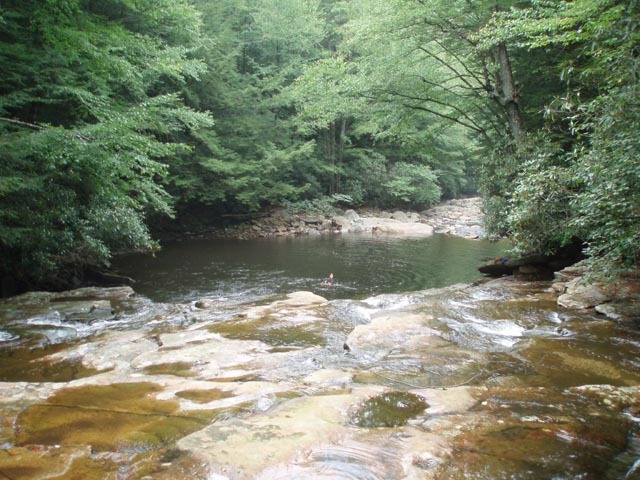 There is a very nice campsite with easy access to water where the Otter Creek Trail crosses Moore Run. This site should be approximately half way between the north and south entrances. The day before I hiked in, I hiked about a mile of the trail from the south entrance and was underwhelmed by the scenery. I decided to look for the north entrance on W Va 72. It is about 4 miles south of the junction of W Va 72 and U.S. 219. Watch carefully for the parking area because its easy to miss. To find the south access, drive east of Elkins on U.S. 33 for about 10 miles. FR 91 is at the top of a hill opposite a sign saying "Shavers Mountain Elevation 3026 feet." There are 2 roads taking off from here so be sure you're on FR 91. It is the one to the west. I didn't bring fishing tackle. 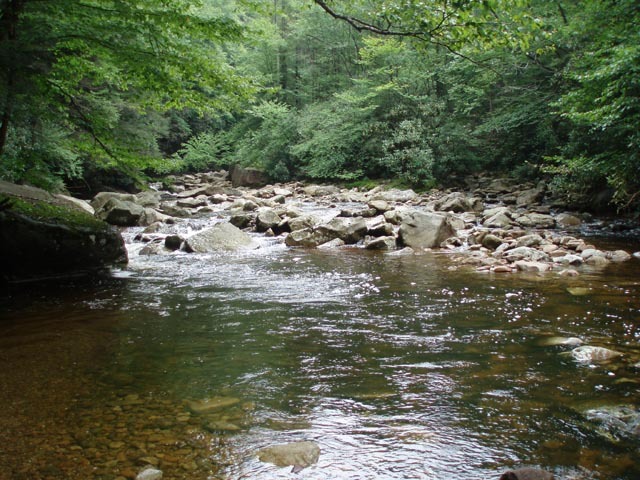 About halfway between the first and second crossing is a deep pool which should harbor some nice brook trout. There are other deep pools downstream of the second crossing but access for casting is difficult. Critique: Two of us did this as a three day/two night trip including the optional day hike for day two. The trail description was very helpful and the GPS information was very valuable at points. 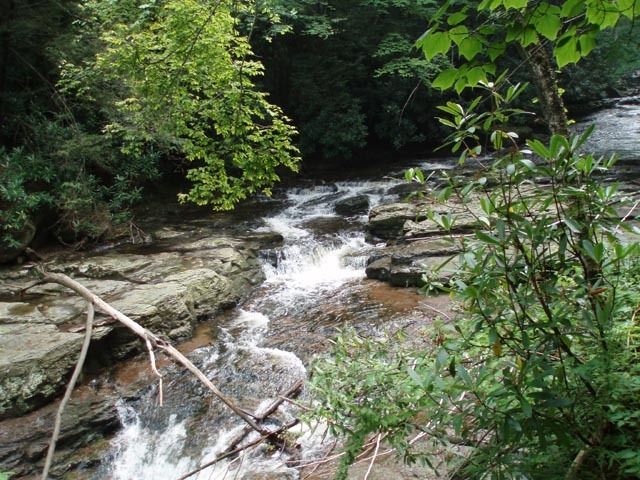 I had spent one prior night in the Otter Creek area and had always wanted to get back for another longer stay. We had wonderful weather in early June and really enjoyed this entire hike. The waterworks are very nice, the stream crossings at this time were not very difficult at all, and the sections of the trail through the bogs were a nice chance of pace and scenery. The suggested campsite at the end of day one is quite nice, had plenty of firewood, and has easy access to water. We spent day two on the optional day hike and had a great time and really enjoyed the scenery and challenge of this hike. I imagine that we will be back to this area before too long to try out some of the other trails in the area. I think Otter Creek has some of the most ambiguous trails of any place I've hiked. But I just wanted to mention if coming up on Moore Run from Otter Creek, before you get to the bog, on your left there is a place where you can see there is a bank and sort of a flat place in the woods above the trail covered by ferns. If you hike up that bank on the level of that flat there there are remnants of old galvanized pails and a there is an old bent crosscut saw that has completely grown into the tree it was stuck in. I speculate they bent it and then just stuck in in the crotch of the limbs because there are no remnants of the handles on the crosscut, so the loggers must have removed them when they bent the saw in the way back when.